Great Chinese food is often hard to come by in the East end. The only semi-reliable place I’ve frequented since relocating from the masses of choices in my old Bayswater neighbourhood is My Old Place (‘Lau Ti Fang’) on Middlesex Street. Their Northern Chinese food, though a bit hit-and-miss, is seriously tasty… Chillies, Vinegar and Szechuan peppers featuring heavily throughout. Be prepared though. The grease-factor here is off the charts. Also, their food menu (the English one that is, for those of you like me who find Mandarin an alien language) is near-impossible to navigate, with vague descriptions like “Spicy Lamb” and “Stir-fried Pork” resulting in serial ordering by trial-and-error. Add to that their service which can be a little brusque and you can start to see why dining here doesn’t always make for happy times. There is a silver lining though, and it comes in the form of My Old Place’s sister restaurant in Bethnal Green, Gourmet San – a fairly recent discovery of mine. What you get here is everything that is good about My Old Place minus the grumpy service and excess grease. Even the menu is a little more friendly for the English-speaking world. 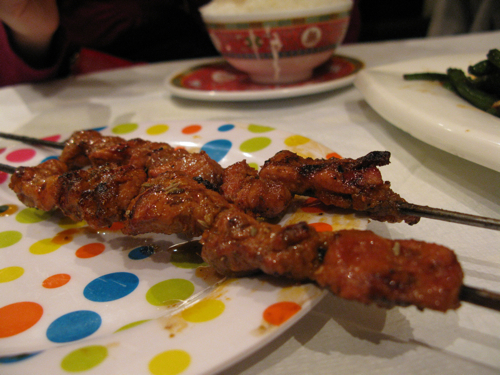 The Xin Jiang lamb skewers, a house speciality from the Northern regions which border Mongolia, are a must. Tender lamb fillets, marinated in a punchy cumin-chilli-szechuan pepper-coriander seed spice blend are barbecued to smoky perfection. Served rustically on ginormous steel skewers straight off the barbie, try not to burn yourself as you bite the meat off, cave-man style. At a mere £1 per skewer, its a real steal. If you are feeling adventurous however, they also do more exotic options such as Quail, Rabbit and Liver amongst others. Another staple which Jo and myself can never resist from ordering are their Green beans, deep-fried with minced pork and buckets and buckets of dried chillies and Szechuan peppercorns. Although a little on the greasy side, it packs a serious punch of spicy flavour and requires a good helping of plain white rice to accompany it. 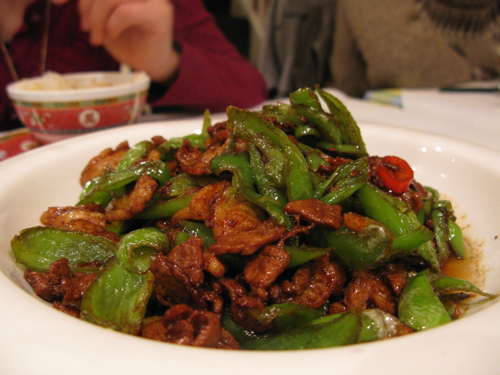 Stir-fried Belly Pork with Green Peppers was a bit of a low-note to an otherwise very satisfying meal. Far too salty from an over-load of soya sauce, it could have also done with more pork and less green pepper. Not the worst we have sampled to date at the MyOldPlace-GourmetSan franchise, but neither is this one of their better dishes. With over 200 choices on the menu to choose from, its bound to be a little hit-and-miss. But there’s no denying the fantastic value here. Spend £15 a head and you will no doubt be needing a doggy bag to take away the leftovers from their very generous portions. It’s no wonder this franchise remains such a popular haunt amongst London’s mainland Chinese community and East-enders alike. If you know how to order the right stuff, its some of the most authentic Northern Chinese and Szechuan cuisine you will get in London. 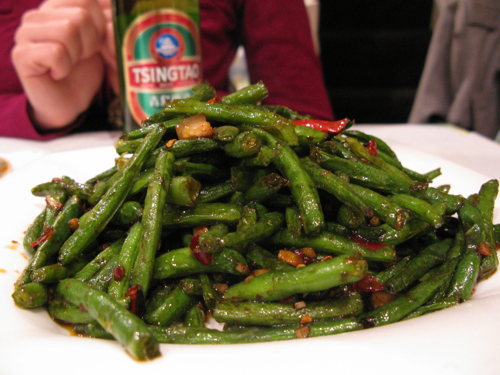 I love the green beans with minced pork and chillie, my most favourite Chinese dish of all times *hungry*. Good to know about Gourmet San, I really got into Szechuan recently and keen to explore new places. Ute: I particularly like Szechuan food this time of the year – the Heat from the Chilli has a defrosting effect =P. Gourmet San’s french beans are delish – cooked with a lot more care (and far less grease) than the MyOldPlace in Liverpool street i find.